Kenyans have begun a social media campaign to raise funds for the family of a Muslim teacher who died protecting Christians during an attack in the country,. People are hailing Salah Farah as a "genuine hero" and a symbol of the country after refusing to be separated from Christian passengers during an al-Shabab attack on a bus traveling from Mandera to Nairobi last month. Al Shabab is a jihadist terrorist group based in East Africa that in 2012 pledged allegiance to the militant Islamist organization Al-Qaeda. After Salah's death, an online campaign was started to raise funds for the teacher's family. "Salah is a hero," Abdullahi Derow, the 26-year-old activist who started the #HeroSalah Twitter campaign, told Al Jazeera. "He was the only male child in his family, his father is now very old and his kids are very small," Nairobi-based Derow, who is also from Mandera, said. "I tried to think about how we can do this for the family, as Kenyans, at least to appreciate what he has done not only for Kenyans but for humanity," explained Derow. Derow got the approval of Farah's cousin Rashid, and now guardian to his children, before launching the campaign. "The children need a shelter, they need education, they need to be cared," Rashid told Al Jazeera. "The father and mother are the same". He noted, "Salah was well respected, a religious man, who had just been promoted to deputy headmaster of a big primary school - he was having a lot of respect in the village." The campaign had raised more than 150 000 Kenyan shillings ($1 460) mainly through the M-pesa money transfer service, with donations ranging from $200 - sent by a female university professor in Canada - to just a few shillings. "Even if someone sends just a few shillings, it can make a big difference," Derow said. Despite being pushed out of Somalia's major cities and towns, al-Shabab continues to launch deadly attacks across the Horn of Africa country. The group, which last week assaulted a military base run by Kenyan troops as part of an African Union force in the Somali town of El-Ade, has also carried out many attacks inside Kenya. Derow said the outpouring of support for the campaign was sending a "clear message" to al-Shabab that Kenyans were united. "There is a feeling of patriotism. Kenyans are feeling by helping the family of #HeroSalah and educating his children is a defiance to al-Shabab," he said. "We are one in honoring are heroes." A year before, al-Shabaab stopped another bus in Mandera in 2014, divided passengers by religion, and shot the 28 non-Muslims dead. 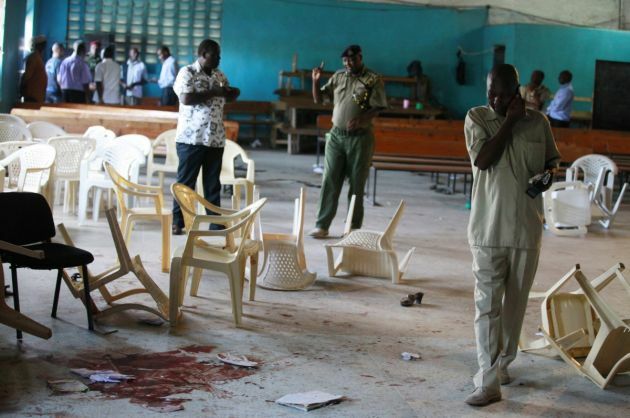 The Somalia-based terrorist group has launched several attacks in Kenya including the massacres at the Westgate shopping mall and Garissa University College, the Associated Press reports. Earlier in January al-Shabaab attacked a camp for Kenyan peacekeepers in south-western Somalia, killing an unknown number of Kenyan soldiers and the group has claimed responsibility for massacring at least 20 people on Mogadishu's Lido beach on Jan. 21. Some 82.5 per cent of Kenya's 46 million people are Christians with Muslims accounting from about 11 percent, most of who live in the coastal region.